There has been a setback to the government's plan to attract investment in new nuclear power stations. Two key players, RWE Npower and E.On, have announced they will not develop new nuclear power projects in the UK. The government says it is disappointed but there remains "considerable interest" in the project. They are two of eight new projects named by the government to replace old power plants which are due to close by the end of the decade, and which make up about a quarter of the UK's generating capacity. But last May Germany decided to close down its nuclear power stations by 2022, following the disaster at Japan's Fukushima nuclear facility. For RWE and E.On, which own most of Germany's power stations, it was an expensive decision and undermined their enthusiasm to invest in nuclear power elsewhere. "It's a big deal that they are pulling out," Malcolm Grimston, an associate fellow at the Chatham House think tank, told BBC News. "If you look at the utilities in Europe then they are two of the biggest. There aren't that many huge players out there who could take over." Volker Beckers, chief executive of RWE Npower, said: "We continue to believe that nuclear power has an important role to play in the UK's future energy mix. "We are therefore looking to ensure that work on development, including grid connection, can be taken up quickly by other potential investors." Energy Minister Charles Hendry said: "E.On and RWE's withdrawal is clearly very disappointing, but the partners have clearly explained that this decision was based on pressures elsewhere in their businesses and not any doubts about the role of nuclear in the UK's energy future. "The UK's new nuclear programme is far more than one consortia and there remains considerable interest. "Plans from EDF/Centrica and Nugen are on track and Horizon's sites offer new players an excellent ready-made opportunity to enter the market," he said. 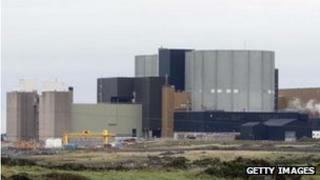 EDF said it was progressing well with plans for two new nuclear units at Hinkley Point in Somerset. But the French company said its final investment decision hinged on it being a profitable project, and for that government reform was crucial. "The government's framework for electricity market reform must ensure we have a project which is good for consumers, policy-makers, jobs and investors," said Vincent de Rivaz, chief executive of EDF Energy. Analysts are now questioning whether firms can make money out of nuclear power in the UK. "How commercially viable these plants are is very questionable," Rhys Kealley, lead analyst at Datamonitor, said. "Even Centrica, who are partnered at the moment with EDF in a similar venture, is reluctant to make a commitment and they will be making a final decision on that some time before the end of the year." The future of nuclear power may become clearer in May when the government announces its plan to reform the energy market. BBC business editor Robert Peston says sources at the energy companies describe this as "a make-or-break decision" as to whether the government is prepared to abandon its previous position that there won't be any substantial subsidies for nuclear, either from taxpayers or customers. Labour stressed that nuclear power was vital to "to make us less reliant on volatile fossil fuel prices, increase our energy security, and keep prices down for families". "RWE and E.On's decision... underscores the importance of the government's electricity market reform delivering a framework that will provide certainty and confidence for other potential investors," said Caroline Flint, shadow energy and climate change secretary. Greenpeace's policy director Doug Parr said: "The government's energy strategy is crumbling. "Not even the billions of pounds of taxpayers' money they have offered as incentives to the German and French nuclear industry are enough to make a new generation of power stations economically viable." Unions have been highly critical of government policy as well. Gary Smith from the union GMB, which represents workers in the nuclear industry, told the BBC: "I think it is clear, the government's energy policy is in absolute tatters. It's a shambles. "Britain is being left as an also-ran in the energy market internationally and the nuclear specifically." The Prospect union, which represents some of the 120 highly-skilled employees working at Horizon's headquarters in Gloucester, as well as staff at the existing Wylfa site, expressed concern about the broader economic consequences. "At a time when we face the closure of several large coal-fired power stations between now and the end of 2015, the Horizon venture was to be a major contributor in achieving a new UK fleet of nuclear power stations to provide a secure low-carbon energy supply for the future," said Mike Clancy, general secretary-designate of Prospect.